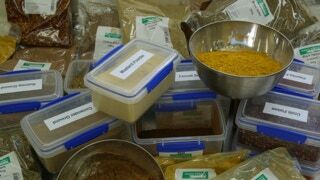 The herbs and spices we use are carefully sourced and blended together to ensure the highest quality for our customers. We believe in using individual herbs and spices to give each flavour its own unique personal note. All our products are lovingly handcrafted to ensure the highest level of quality and taste. BavariaNZ goods are made with real New Zealand meat only. We pride ourselves on being gluten free, with no bread or other carb based fillers, just meat, herbs and spices. At BavariaNZ we strongly believe in using local free range meat. We proudly source our pork from Longbush Free Range Pork, where happy pigs are raised ethically and sustainably in the rolling hills of the Wairarapa valley. We are 100 percent passionate about using New Zealand natural sheep and hog casings, guaranteeing a curved smiling sausage that has appeal, snap and instant flavour. Knowing your sausage casing is natural is easy: if it is curved it is natural.